08/31/15 – I’ve begun a baby quilt. The pattern is called ‘Bright Hopes’. Truthfully, I don’t dislike it but I’m not jazzed by it. I’m hoping with the addition of a border, I will find it more appealing. I have a distant relative expecting her second child in Spring so the plan is to gift it to her. It will be completely unexpected and I hope the surprise is pleasing. If time allows, I’ll also make some other baby things (gowns, bibs, etc.) and a little gift for the first child (a bug or frog or lizard-printed pillowcase). 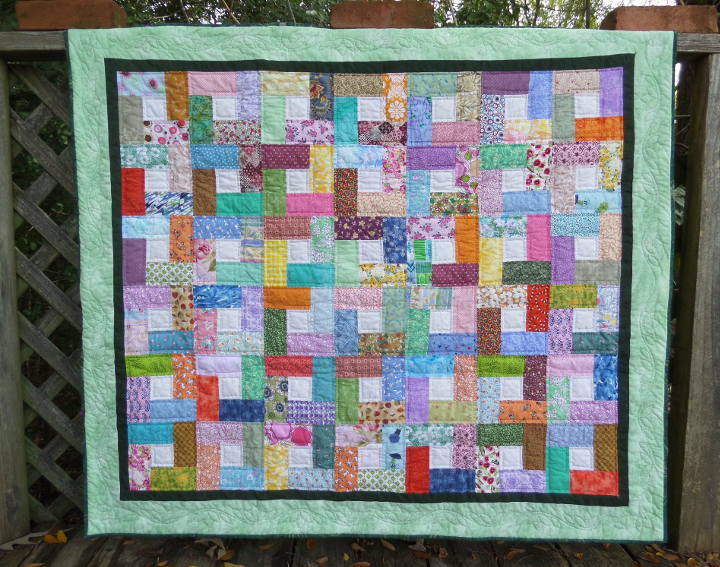 Bright Hope’s 6″ blocks are made using 2 ½” strips I have previously cut. They are stitched on Frankentreadle and thus far, the top is completely machine made. I plan to hand quilt it. The top currently measures 36″ x 42″. Am ‘interviewing’ borders, not knowing if they will be plain or pieced. I’m leaning toward plain borders where hand quilting will be spotlighted. Looking forward to the quilting! 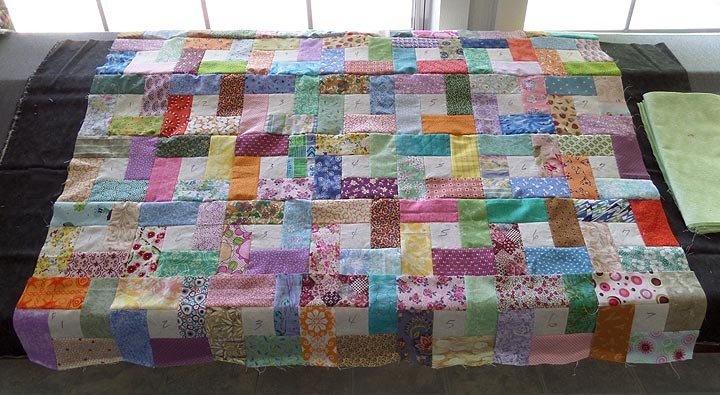 09/05/15 – Decided on, cut and added first narrow (1 ½” finished) border. Corners still need to be mitered. 09/10/15 – Borders added and mitered. The fabric for the backing is a little too small so added a ‘brick’ strip. 09/15/15 – Basting is done and quilting has begun. I’ve chosen a square-in-a-square quilting design with a scalloped vine with tulips stencil for the border. 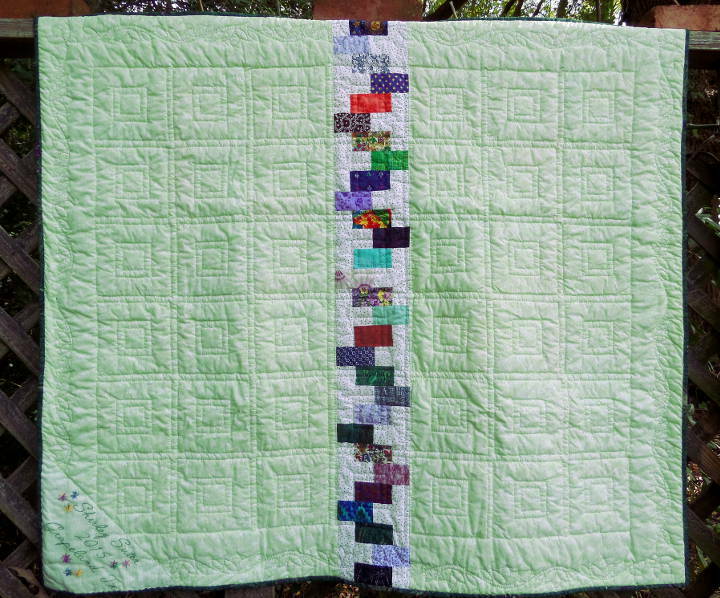 The blocks are quilted using pastel variegated YLI thread. The border vine is done in dark green and the tulips dark red YLI thread. The binding is dark green batik fabric from the stash. 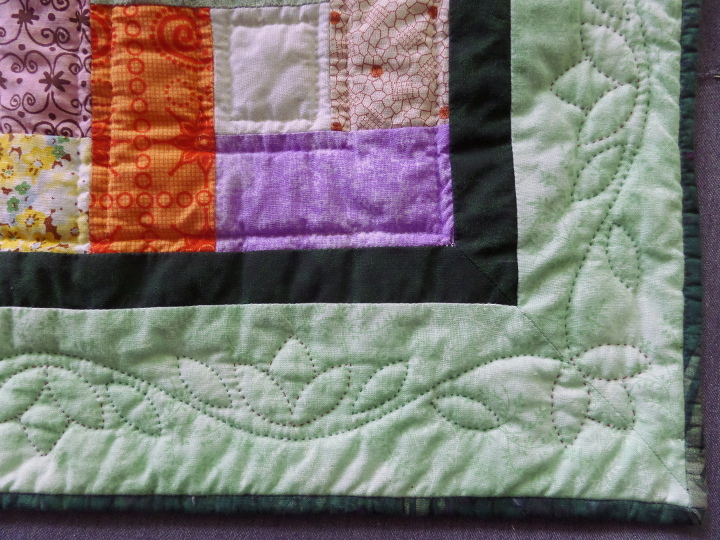 10/27/15 – Quilting is complete and machine sewing the narrow binding is done. Tonight, I’ve worked on hand stitching the binding and embroidering the label. 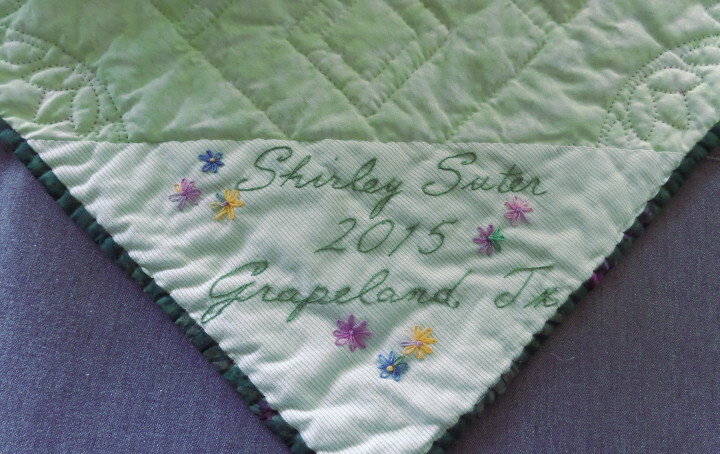 10/29/15 – Quilt is finished, labeled and laundered. Final measurements are 42 ½” x 48 ½” Photos to follow as soon as the rain ends. 11/03/15 – The rain has stopped and the deck is dry. Photo time! 11/10/15 – Sent to Kristy and Aric for their new baby boy expected in Spring.